These days, you don't need to attend a cultural event in person in order to be a part of the experience. More and more events are broadcast on TV or streamed online. As part of the POPSUGAR Insights Content, Culture, and Commerce study, we surveyed over 1,500 women between the ages of 18-44 and asked them to tell us which types of cultural events they are most interested in watching on their television or streaming media device. 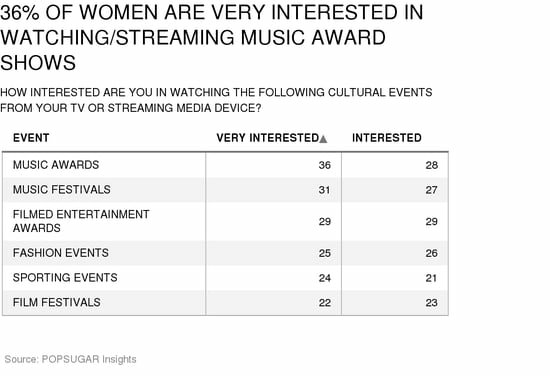 Overall, music cultural events are extremely popular, with 64% of women very interested/interested in watching music award shows via their television or streaming device, followed by 58% who are very interested/interested in watching music festivals, like Coachella or Lollapalooza. Filmed entertainment awards like the Academy Awards or the Golden Globes rank third overall, with 57.8% of women very interested/interested in watching or streaming. Fashion events, like NY Fashion Week or the Victoria's Secret Fashion Show, rank fourth overall, with 51% of women very interested/interested in watching or streaming the event. To round out the list, women were very interested/interested in watching or streaming major sporting events (46%), like the Super Bowl or World Cup, followed by film festivals (45%), like Sundance or the Tribeca Film Festival.